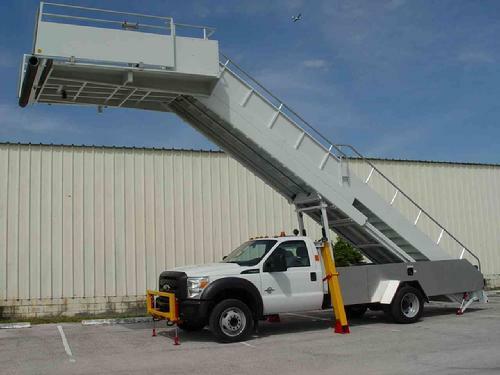 THE PHOENIX MODEL PAS228 PASSENGER ACCESS STAIR IS A TRUCK MOUNTED PASSENGER STAIR THAT WILL SERVICE COMMERCIAL AND MILITARY AIRCRAFT WITH DOOR SILLS BETWEEN 96 INCHES AND 228 INCHES. THE PAS228 IS CONSTRUCTED USING HEAVY DUTY STRUCTURAL STEEL COMPONENTS AND GALVANEAL SIDE PANELS FOR ADDED CORROSION RESISTANCE. NIGHT LIGHTING IS STANDARD WITH THE PLATFORM, STEPS AND GROUND ENTRY AREA ILLUMINATED. THE LIFTING FUNCTION OF THE PAS228 IS ACCOMPLISHED USING AN ENGINE DRIVEN HYDRAULIC PUMP. THE CONTROLS ARE ELECTRICALLY ACTUATED FROM THE INTERIOR OF THE CAB.